This is an amazing video for anyone interested in climate change and sustainable land management. Just wanted to share it with the Newlands Mob because it is so very hopeful!! Hi, as 2013 is moving along; we are doing a bit of planning and would like to find a house sitter during the Xmas/New Year /School holiday period. We would like someone or a family that is recommended to house sit during this time, in return for accommodation we would like our two small dogs looked after and plants watered. The house is three bedrooms, with two seperate living areas and plenty of yard space, close to bus and tram public transport and Merri Creek bike path/walking track. Coburg Senior High school has a new web site which now includes a page on the new Coburg Junior school opening in 2015 and a FAQ page. To have that perfect Easter breakfast next Saturday, you could use a crusty lightly sweetened Easter bread! And it is all possible at your doorstep! (well, almost, it will be at my doorstep; 56 Livingstone Street). Please put your order in before Friday noon, and you can pick it up at 9am or earlier on Saturday. I still make the crusty white sourdough, and the crusty wholemeal sourdough. 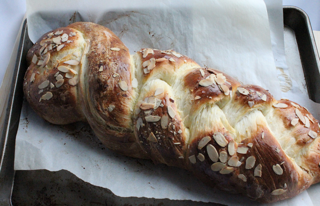 The Easter bread will be sourdough, and contain a small amount of sugar and almonds. And it might look a little bit like the picture…. Orders: mobile 0438175764 (text preferred). I have just been pruning my bay tree and rosemary bush I have left some prunings out on the nature strip (at 13 meadow St) – they smell great - please come and grab some. is broken, but a new one can easily be ordered online. Orkeztra Glasso Balshade. 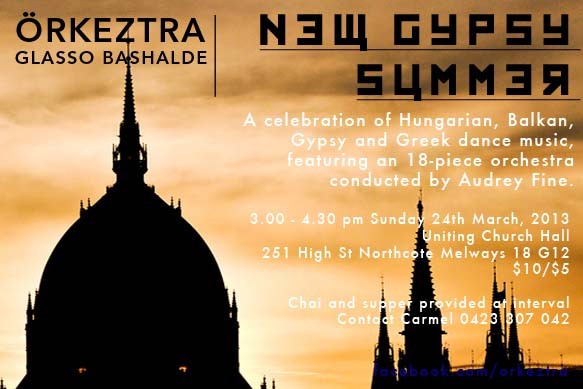 We play gypsy, Balkan Arabic and Jewish music. We have our termly concert on Sunday March 24th at 3-4.30pm. At Northcote Uniting Church, 251 High St, Northcote (in the hall at the back). Entry - $10/$5. All welcome. I have just learned that I have to move out of my Coburg residence in 60 days time. My generous friends Allie and Adrian have kindly offered a teaching space in their West Brunswick home so Chicks with Picks Melbourne can keep strumming away. I've decided to take this news as an opportunity to do some house sitting for a while. So, I'm wondering if you could put the word out to your friends and neighbours that I am available to look after their houses, when people head off on holidays, and pets, I find cats very intriguing and very much enjoy a walk with a dog and put me in a room with a singing bird or a swimming fish and I feel pretty damn fine. I would even consider looking after a teenager or two if mum and dad had to head off while the kids needed to stay home and attend to their schooling. I am starting an organic and natural foods business – SELF – Wellbeing Supermarket. I realise there are a few co-ops in the area – however if you are not part of a co-op this could be your new local source of great high quality organic and natural foods. And if you are part of a co-op maybe this could supplement your other purchases. Before I launch I would love to get some opinions and try out a few things. So check out my price list (you will need to email me to get it), complete the online survey http://www.surveymonkey.com/s/5HMT7H3 and get 10% off your order as a present for being my guinea pigs and providing me with a bit of info! Orders are due by Sunday 24th of March to pick up before Easter – Just in time for the school holidays! (Pick up Wednesday 27th after 3pm and Thursday 28th after 1pm at 13 Meadow Street Coburg) or arrange to pick up after the Easter long weekend. Love you to send me an email or give me a call with ideas, questions and of course an order! I would really love to hear your thoughts and ideas for what else I could source / offer. Please email or post your order through by Sunday and confirm your payment. Apologies for the short time frame in the end. I look forward to catching up when you collect your goodies. Inspired by my upbringing and love of the flavours of my home, Tuscany, Your Tuscan Chef is a local business which offers Tuscan cooking lessons and personalised Tuscan feasts (modern, traditional, Medieval and Renaissance). My dream with Your Tuscan Chef is to bring the flavours of my home and the secrets of my regional cuisine to you. I wish to share age old traditions that have been passed to me by my family to give you an unforgettable culinary and cultural experience of Tuscany, here in Melbourne. For my cooking lessons I bring my home cooking and family specialties to you. You choose the dishes that you would love to learn to make and after our cooking session we sit around your table with some wine and indulge in our creations. Lessons usually consist of a 4 - 5 hour session during which we'll prepare a delectable 3 - 4 course lunch or dinner that we'll feast on together with some wine. Lessons can be conducted in English or Italian. These are tailored to your personal tastes and dreams, cooked and organised by me in the kitchen of your home. Delicious, carefully balanced seasonal menu options available (for groups of 2 or more people) using the freshest, quality ingredients - and I leave your kitchen sparkling! Join me in Melbourne and let me share my passion for the food of my family and region with you. Just a few places left now for my next Tuscan cooking class on Saturday April 6 (4 -9pm) in Ivanhoe. This lesson is a fundraiser for The Catherine Wotton Scholarship Fund. The scholarship will provide registered nurses the opportunity to be specifically trained in the area of gynaecological cancers. The aim of this scholarship is to address the current shortage of gynaecological nurses, so that women are supported through their cancer journey, whilst also raising awareness of gynaecological cancers amongst women in the community. To support this cause and book or for further details about Your Tuscan Chef, call Simone on 0451 794 844, emailinfo@yourtuscanchef.com.au or visit Your Tuscan Chef on Facebook. 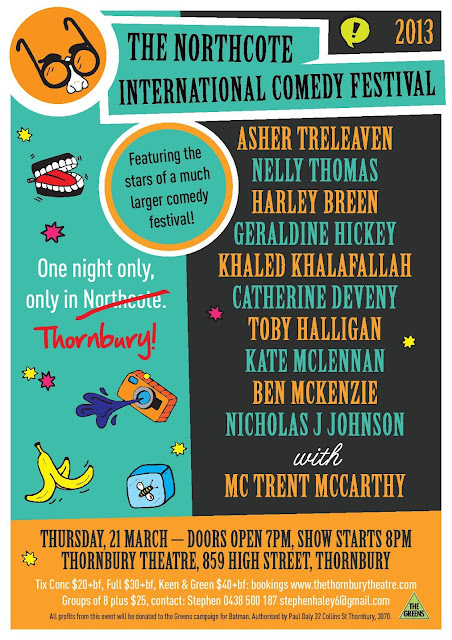 Nelly Thomas is a mum up at Newlands Primary School and a well known comedian who has been performing around the traps for a few years now. She has a comedy gig coming up later this week that will be well worth checking out. You can also find out when her other shows are by visiting her website www.nellythomas.com or joining her emailing list. Thurs, 21 March at the Thornbury Theatre. All profits from this event will go to the Greens Campaign for Batman (i.e. gently ousting Martin Ferguson and installing Alex Bhathal as our local member). Wow, that's a lot of talent. But wait, there's more! Hayman A Kent - Slowly standing-up comedian, singer, writer, radio broadcaster, born in Gippsland! PLUS! A very special guest appearance from Martin Ferguson himself! We're very pleased (and a little surprised) to have the inimitable Mr Ferguson launch our festival - it should be interesting! Please note: Unfortunately, this is not a wheelchair accessible venue. Some of you may be aware that Coburg North Primary will be hosting a farmers' market come late April, from 8am - 1pm, every 2nd and 4th Saturday of the month. CNPS families will have a stall selling delicious dutch pancakes and there will be lots of other great fresh produce on offer. Entry is by gold coin donation to support our fundraising at the school. 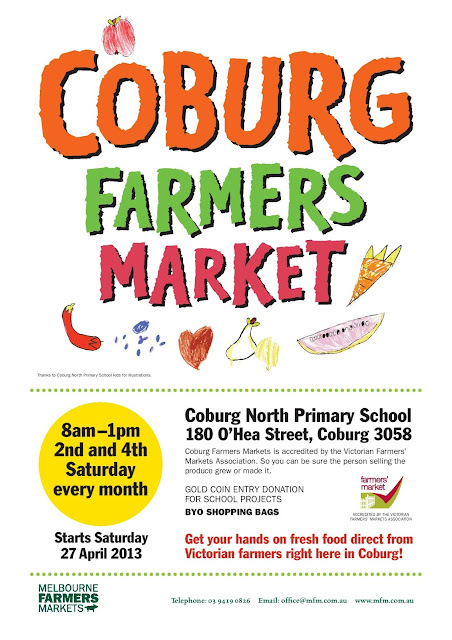 Please spread the word among your friends, neighbours, and at your schools and community groups and come and join us and other families and kids from Coburg North Primary School and the wider community! Does anyone know of a reliable gardener that is in the local area? Our former gardener is no longer undertaking residential clients so we are on the lookout for someone who can help us out. We are looking for a gardener to do some mowing, racking of leaves, some occasional whipper-snipper work, clearing of paths and to take all the clippings away. If you know of someone or are you ARE that person, please get in touch. Free to good home- whizz bang machine in photo. Also have bread maker ( ALDI model) that is no longer needed. 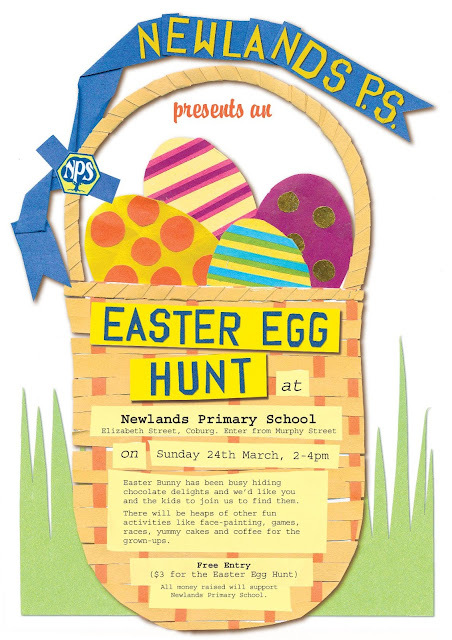 Come along for a fun filled afternoon of music, games, coffee, cake and egg finding!!! Is anyone going away over Easter and wants their house sat? My parents are coming for three weeks from the UK on 29th March. We have three children in a two bedroom house.....so we are eagerly seeking accommodation for them. Can pay rent, feed animals and water plants. Any length of time would be great. I have lost my dog. He went missing between 6pm and 9.30 Friday. My back gate looks as though it has been broken. If anyone knows ANYTHING please let me know, thank you. He is a small 13 year old blue heeler, but looks much younger, he has a black collar with 2 council I.D. tags. 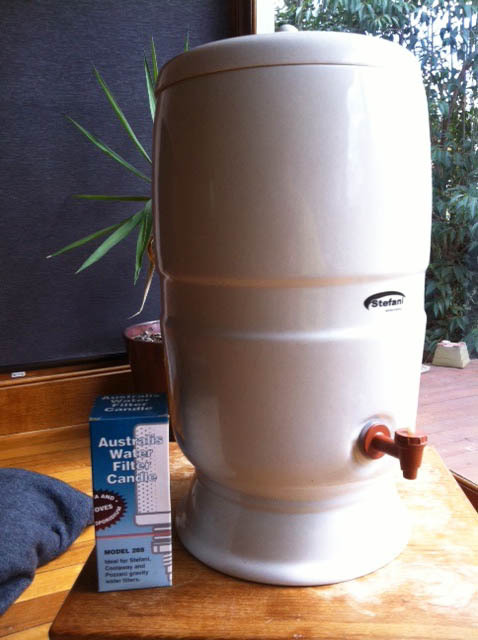 Hi Community news – we are having a big junk sale at our Scout Hall in Carr Street, Coburg North. We have stall areas available for hire at very small cost of $10! Please contact Carmelina if interested on mob: 0421085462. Come and grab a bargain before you head off to the Newlands Primary Easter Egg Hunt! Job to do this weekend! Check the garden for snail hidey holes, bring them to the swap this Sunday 2-3. Holiday accommodation in Anglesea/ Airies Inlet. Does anyone have a shack or caravan or know anyone who rents holiday accommodation around Anglesea/Airies Inlet way. I’m dreaming about taking kids away over easter for a little holiday 1-3 nights. If you know anyone please call Kat 0412 992 513 or email dancingkat@iprimus.com.au Thanks! Does anyone know of a hip hop class for kids on Saturday morning? Dan is keen to give it a go..
Hi to our wonderful community! I am enquiring for my brother in law who is in need of setting up a new household very quickly. So we are searching for somone that has a set of single bunks, or a couple of single mattresses that they are happy to get rid of. Free 1-2 year old clothes. Would anyone like 2 bags of 1-2 year old clothes? Please call and arrange a time to collect. I hope that someone can benefit from them, else I'll take them to the opp shop if no response by Next Thursday. This two bedroom home is ideal for a couple or a young family. The house has a lovely feel to it, bright and friendly - I have loved living here. Both bedrooms have built in robes. The kitchen and living area are separate, there is one bathroom (the toilet is separate) and a laundry. Ceiling fans in living area and master bedroom. Central heating throughout. Floorboards throughout, besides bathroom and laundry (tiles). There is a front garden with small lawn and room for vegies or other interesting plants for keen gardners! Decking area out the back is great for entertaining. Ten minute walk to #1 and #112 trams, five minute walk to corner shops at Elizabeth St and Murray Rd. Coburg Olympic Swimming Pool just around the corner which is fabulous in the summer months. Off-street parking for one car, not covered. Bond - 1 month's rent. Terms of lease can be negotiated. Classes will be taken by Emily of Moving Yoga. The classes will offer you a little self-nurturing time with a balance of stretching, strengthening, relaxation and meditation. Classes will be limited to a maximum of 12 participants. Reservation is not necessary however you can reserve a spot by calling Outcomes Fitness on 0400 244 329 or sending a request via the Outcome Fitness website. If you have any injuries, queries or concerns, feel free to contact Emily in advance via the Moving Yoga website. Alternatively, arrive at least 10min early so that there is time for us to have a chat. If you have a blanket, or alternatively a large towel, please bring it along. Mats will be provided but you are welcome to bring your own. For those that like contemporary art, to reflect in a Labyrinth, and like to remember easter for the real meaning, all are welcome to a Stations of the cross exhibition. 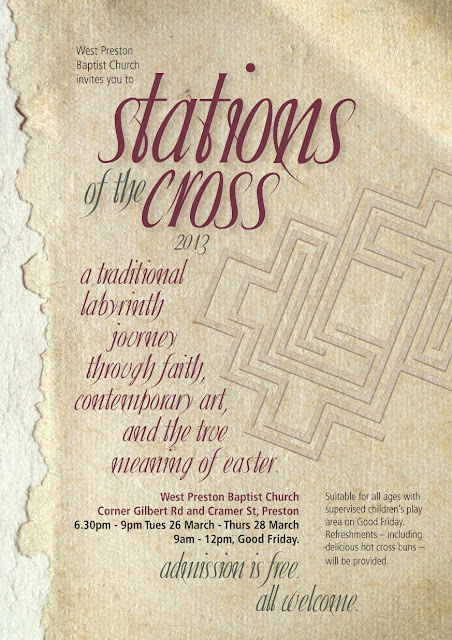 To be held on Tuesday, Wednesday and Thursday evenings 26th-28th March and Good Friday morning 9am-12 midday. To be held at West Preston Baptist Church. Further details below on flyer. Shake, Shift, SurrenderCreative Dance Workshops for Adults at Prana House, Thornbury. Held monthly on Friday nights. Next one Fri 22 March 7-9-pm $20. I hope everyone is enjoying some cooler air! Our first event is happening this Sunday, March 17th from 1 PM at the Ronald St footbridge area. We have a reptile awareness session running which is going to be conducted by the Snakehandler (www.snakehandler.com.au/?p=reptile-awareness). The forecast is for a lovely 22 degrees. of relationships to; ourselves, others & the environment, we will explore, inquire, reflect, respond & re-create. Resources will be offered to support practitioners implement aspects of the sessions into their practice. No art experience required and all art materials/afternoon tea included. Creatively AgeingWeaving memories, poems & wild stories. For elderly people. Carers are welcome to attend. The arts have long been acknowledged as contributing to people’s well-being & are accessible to everyone. Drawing on my Creative work with Elderly people living in residential care & accessing day respite at a centre in Melbourne, these sessions will provide a space for crafting your wild stories into treasured textile art pieces. A gentle, nourishing space for you. No art experience required & all art materials/afternoon tea included. Cost: $20 per session/$15 Conc. or $35 for both sessions/$25 conc. A space to receive, to explore and to nourish self – care. The arts have long been acknowledged as contributing to people's well-being and are open and accessible to everyone. Maybe you care for a loved one and would like to exploresome ways of being creative - to also care for yourself. I draw on 10 years Nursing and 5 years of parenting and creatively working with a wide range of people including children and adults, who require intensive support or full- time care. I offer a gentle, safe, nurturing and nourishing space for you to gather with others who may share some of your experiences. No art experience required & all art materials/afternoon tea supplied. Cost: $25/$20 conc. per session or $65/$50 conc. for all 3 sessions. Limited Places.